Motherhood is a lot about instinct, and it's also a little about trial and error too. In the last six months, we've discovered the diapers, creams, body washes, shampoos, and pacifiers that work best for Greer. Part of that came easy, and others did not as we tried our way through way too many pacifiers until we found the right fit. The baby basics, while not always easy to determine when it comes to preference, are really no-brainers. They are the items that go first on your registry, and the ones people talk about most. Then there are the items that you discover down the line and wish you had known about from the start. We have most certainly found ourselves in that boat, and thankfully we discovered some amazing products to use for our babe while she's still of the appropriate age. And I thought I would share some of our unexpected must-haves that change the whole parenthood game. Put these on your registry now, and you can thank me later! 1. DockATot || This dock has been incredible in our home, as a place for Greer to sleep and play. I wish we would have had it for her when she was a newborn. I think she would have slept so much more soundly in it, especially since she was not a swaddle baby. Oh the extra sleep we could have gotten. These days it's the spot she naps when she's not in my arms. It's also where she lands after her first early morning (5 AM) nursing, giving her and mama + daddy a couple more hours of sleep. She loves feeling snug and secure in it. 2. Wood Teething Rattle || Greer loves the noise the beans in this rattle makes, and like any teething baby she loves putting it in her mouth. Since it is it finished with natural vegetable seed wax, and the Indian hardwood is untreated, it is safe for her to put in her mouth. And this mama loved that it was a camera! 3. Shopping Cart Hammock || The grocery store has never been such a breeze with a baby in tow. Literally, this cart hammock changed everything for us. Greer can go straight into it, or her carseat can sit nestled in it. Both options allow for secure latches to be buckled, keeping baby safe. It keeps you from pushing a stroller + cart through the entire store, puts baby in your view, and gives them the opportunity to be entertained by all the sights and sounds going on around them as you shop. This would make a great baby shower gift, and most definitely needs to go on your own registry. I can't count the number of people that have complimented it and asked where we got it as we go through the grocery store. 4. Lorena Canals Rugs || Like any mama, you want to decorate your tot's nursery from the moment you find out your expecting. Finding items that are not only baby safe, but baby friendly can be a challenge. As the mom to a baby that has dealt with some reflux, tummy time almost always causes some kind of spit up. And spit up on your new nursery rug is just not welcome. Not to mention all the drool! These rugs are genius because they are washable. As in, stick them straight into your washing machine, and you've got a fresh rug! Their selection is endless, and lovely! Plus the price point is great for such an exceptional rug! 5.Two Piece Stroller Set || These toys have been great entertainment for Greer while she is in her stroller or carseat. I love that they attach, and can't be knocked or dropped to the ground. Plus, they're super cute! 6. Coverall || This outfit has been perfect for days when it's not quite cold and it's not quite hot. The snaps make it easy for diaper changes, and the pattern is the sweetest. If you're looking for an outfit that is 100% organic cotton with eco-friendly dyes and inks, and is easy to get on and off of baby this is the perfect one. 7. Milestone Baby Cards || These aren't pictured above, but they have been great markers for big milestones in Greer's life. The sweet little cards offer beautiful illustrations and include everything from monthly ages to the first time baby rolls over and walks. They are perfect for adding to any photo to document your little one's development. I hope this list was helpful for you mamas, soon-to-be mamas, or gals gifting mamas!! We love all of these items! 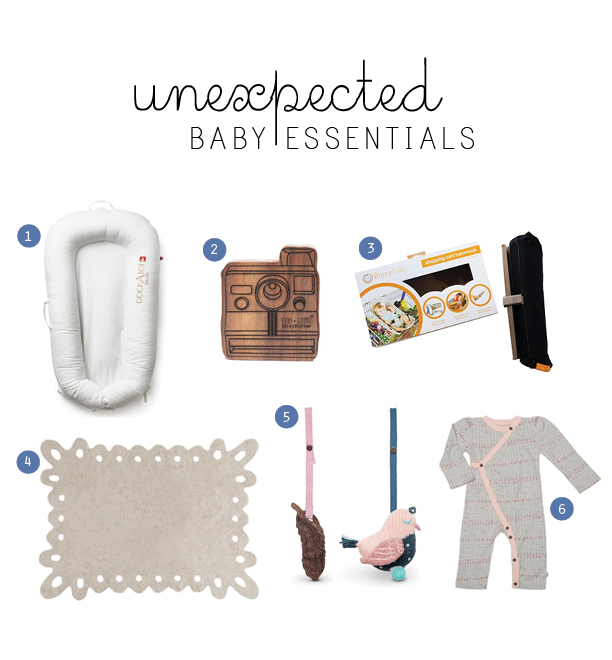 What are your unexpected baby essentials? Thank you to to each of these companies for providing the mentioned items! The review and thoughts are all my own.